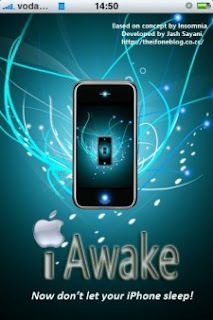 Dont let your iPhone Sleep by the help of a new application - iWake. It allows users to keep the iPhone's screen off while letting applications use the WiFi or EDGE Connectivity for Downloads. The new app is particularly very useful while using applications like MxTube and iSlsk as it saves a lot of battery because you can run them in background and then press the sleep button but still you will have an uninterrupted download. To use it, just tap the iAwake icon, and it will turn on. To switch it off tap it again. You will find this app in Utilities if you have ModMyiFone repositories added in your sources. Iphone modifications are an excellent way of keeping up to date with technology and also the usefulness of using the latest applications. They also add value to the price when recycling a mobile phone. An iphone retains it's value well so when looking to recycle you can get a large proportion of the cost back on a working model. Having an iPhone myself, i didnt realise there was an app out that stopped it from sleeping. Although i guess i should have thought about it. I agre with the previous comment that it helps to bring more people to the iPhone as a whole and what gives them amazing resale value!